The Megophryidae is a group of frogs with some archaic anatomical and behavioral features. Currently we count 22 species in East-Malaysia. This is approximately 15% of all megophryid species. The size ranges from just over 20 mm in some Leptobrachella species to 125 mm females of Megophrys nasuta. Bornean megophryids are leaf litter frogs. 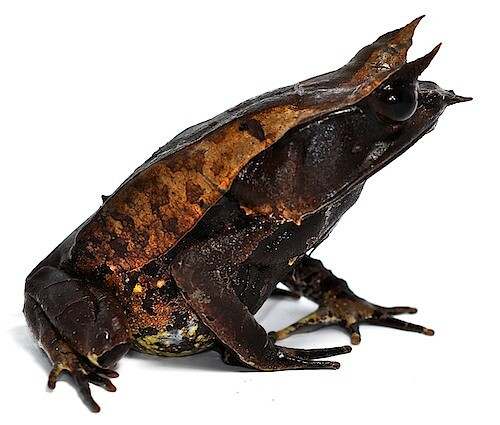 Species of Leptobrachium and Megophrys have broad heads and are capable of swallowing large prey such as large cockroaches, snails, and possibly other frogs. All Bornean megophryids need streams for their tadpoles. The larvae can be generallists (Leptobrachium) or can have highly derived anatomical features and life styles (Megophrys, Xenophrys, Leptolalax, Leptobrachella).